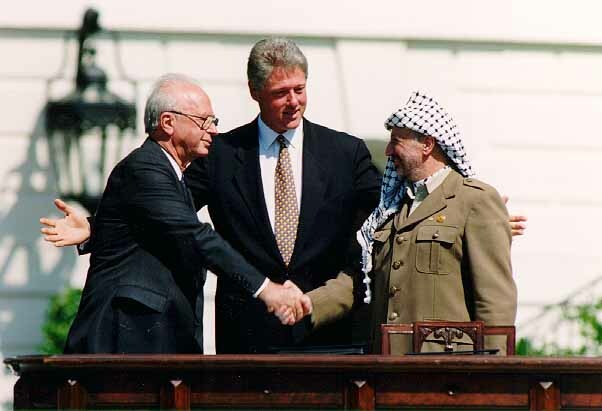 The peace negotiation process as set out in the Oslo Accords was intended to lead to peace between Israel and the Palestinian People and mutual recognition of each other’s “mutual legitimate and political rights” (Preamble, Oslo I and Oslo II). In this context Israel was prepared to compromise on the historic and legal rights of the Jewish People in the area, through agreement for peaceful relations. To this end the parties agreed in the Oslo Accords not to initiate or take any steps that will change the status of the territories pending the outcome of the permanent status negotiations (Oslo II, Article 31(7)). This overall series of commitments and obligations constitutes a contractual framework of obligations between Israel and the Palestinians, signed as witnesses and guarantors by the King of Jordan, the Presidents of the U.S. and Egypt, the Foreign Ministers of the Russian Federation and Norway, the EU and endorsed by the UN. By petitioning the UN, the International Criminal Court and international organizations to recognize them and accept them as a full member state, and by their unification with the Hamas terror organization, the Palestinians have knowingly and deliberately bypassed their contractual obligations pursuant to the Oslo Accords in an attempt to prejudge the main negotiating issues outside the negotiation. This, together with their attempts to delegitimize Israel among the international community and their attempted actions against Israel’s leaders, has served to frustrate any possibility of realization of the Oslo Accords, and as such the Palestinians are in material breach of their contractual obligations. By the same token those countries supporting them are in breach of their obligations and guarantees as witnesses. By all legal standards, according to the accepted and universally recognized laws of contracts and international agreements, a fundamental breach enables the injured party to declare the agreement void and is freed from any further obligations pursuant to the agreement or contract. Therefore the fundamental breach of the Oslo Accords by the Palestinians is indicative of their conscious decision to undermine them and prevent any possibility of their implementation. As such they have rendered the Accords void. In such a situation of fundamental breach and according to all accepted rules of contracts and agreements, Israel has the legitimate right to declare that the Oslo Accords are no longer valid and to act unilaterally in order to protect its essential legal and security interests.